Lease effective, memorable, hard-to-obtain domain names for ballot measure campaigns. Your campaign’s website is one of the most important tools you have to reach the voters who will determine the outcome of all your hard work. It’s there 24/7 to help answer voters’ questions and to convince them to vote as you would like them to. Every voter who fails to hear your message has a greater potential to vote for your opposition. Make your message as easy to reach as possible. Just as location is vital to success in real estate, your internet address, your domain name, is vital to success on the web. Your domain name should appear everywhere so when someone reads, hears, or speaks it, they will receive a reminder of the action you want them to take. 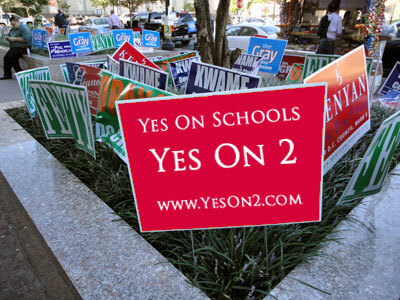 Ballot measure campaigns typically use standard-format domains like YesOn2.com, VoteYesOn2.org, NoOnProp2.com, NoOnQuestion2.org, etc. Voters know this and will guess at these domain names first. Your campaign website can have multiple domain names pointing to it including your domain name from before you received your number/letter assignment. Opposition campaigns occasionally register domain names applicable to your campaign and either forward them to their website or, worse yet, post a website pretending to be you, a spoof website. It’s unethical but it happens. Here's an interesting Time Magazine article on the subject. Acquiring these secondary ballot measure domain names not only helps prevent interference by your opposition but it enhances your ability to capture more voter non-search engine traffic. ... Over 2/3 of Our Clients Do! Savvy campaign managers know the value of maximizing access to their website. They choose Ballot Measure Domains. They win! You've spent a lot of time and money on your website. Get some traffic! !